Cleveland Browns associate head coach Freddie Kitchens reacts on the sidelines against the Pittsburgh Steelers during the second quarter at Heinz Field in Pittsburgh. 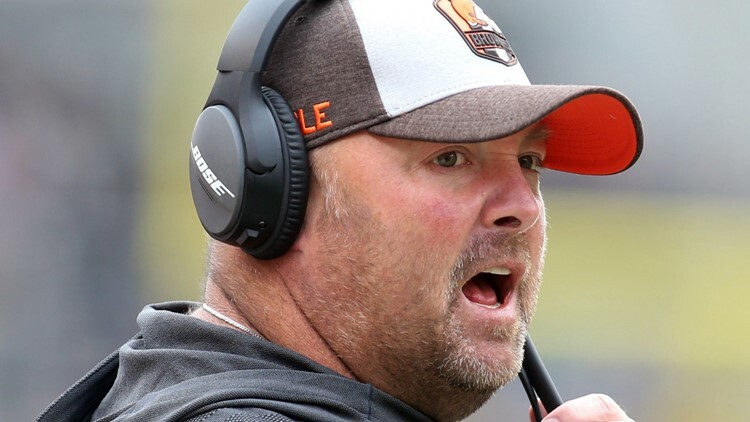 CLEVELAND — Midseason coaching changes typically don’t result in the kind of success the Cleveland Browns experienced during the 2018 season, and interim offensive coordinator Freddie Kitchens was a big reason for improved play from the offense. Prior to the dismissals of coach Hue Jackson and offensive coordinator Todd Haley, the Browns averaged 21.125 points per game on offense, but were outscored by more than five points an outing. Conversely, once Kitchens took over the play-calling duties, the Browns showed improvement in points per game scored. The Browns averaged 23.75 points, up by more than 2.5 points per game. Rookie quarterback Baker Mayfield tied the NFL’s rookie record for the most passing touchdowns, 26, when he found Landry open along the left side of the field for a 48-yard touchdown that shrunk Baltimore’s lead down to 20-14 early in the third quarter. On first-and-10 from the Baltimore 48-yard line, Mayfield took a shotgun snap from center JC Tretter, appeared to fake a pitch to running back Duke Johnson Jr., who was running across the formation from right to left, and then, fired a throw to Landry down the numbers on the left side of the field. Landry caught the ball at the Baltimore 22-yard line with his back to the end zone, but quickly spun around and hustled his way across the goal line for the touchdown. Mayfield broke the record with a touchdown pass late in the fourth quarter against the Ravens. More comfortable with his expanded role, Chubb became a more productive back for the Browns after the midseason coaching staff upheaval, and certainly, he showed that in a 28-16 victory over the Atlanta Falcons at FirstEnergy Stadium in Cleveland on November 11. On second-and-10 from the Cleveland eight-yard line with 8:45 remaining in the third quarter, Chubb took a handoff from quarterback Baker Mayfield, rushed behind the blocks of right guard Kevin Zeitler and tackle Chris Hubbard and quickly got into the second level of Atlanta’s defense. Chubb high-stepped his way out of a tackle at the Cleveland 22-yard line and sprinted his way up to the 45, where wide receiver Antonio Callaway was frantically waving for him to go left so he could finish off a block. Chubb sprinted the final 50 yards into the end zone for the touchdown before dropping the ball to celebrate with his teammates, and the Browns did something Atlanta could not do, as they tackled him before he reached the sideline. Mayfield and the Browns literally came out firing in a win over the Carolina Panthers at FirstEnergy Stadium on December 9. On first-and-10 from the Cleveland 25-yard line, Mayfield took a snap under center, faked a handoff to running back Nick Chubb and rocketed the ball down the numbers on the left side of the field, where wide receiver Breshad Perriman had gotten behind the coverage of Panthers cornerback Donte Jackson. Two plays later, wide receiver Jarvis Landry ran in for the touchdown from three yards out. The Browns struggled to find rushing yardage over the first three quarters of play against the Panthers, but Landry proved to be a catalyst to the running game, as he broke free for a 51-yard gain on a misdirection play that set up the offense for the go-ahead score. On third-and-two, Mayfield faked a handoff to Perriman, who was going from left to right across the formation, and then, slipped the ball to Landry in the middle of the field. After taking the handoff, the veteran pass catcher moved the ball down the field in short order. After an initial burst of speed through a gap at the line of scrimmage, Landry cut across the field and outraced several Carolina defenders before being chased down from behind by multi-time Pro Bowl linebacker Luke Kuechly. Landry can do way more than just create separation from a defender and make one-handed catches, as he can throw the ball a little bit, too, and is not afraid to show off his arm strength. And show off Landry did midway through the second quarter against the Cincinnati Bengals at FirstEnergy Stadium on December 23. The Browns’ second scoring drive of the game covered 70 yards in just three plays in large part because of Landry. On first-and-10 from the Cleveland 30-yard line, Landry took a double-reverse pitch from Callaway and fired a throw to Perriman for a 63-yard gain. Landry’s throw moved the Browns from their own 30-yard line to the Cincinnati seven and set up a touchdown.